@sugarsock Funny #BP now thinks they own the land and airspace, to stop reporters from filming. Maybe execs should have to move there. 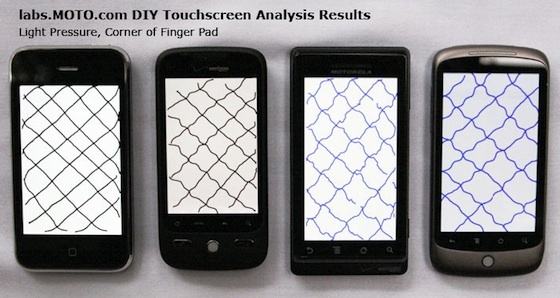 Touchscreen accuracy of the iPhone is much better than that of Verizon's Droid or Google Nexus One. When you're trying to tap a link, chances are you're going to be successful on the iPhone, and not on Android phones. iPhones showed straight lines in tests with both light and medium finger pressure, while the Android phones showed zig-zag wavy lines across the screen. "On inferior touchscreens, it's basically impossible to draw straight lines. Instead, the lines look jagged or zig-zag, no matter how slowly you go, because the sensor size is too big, the touch-sampling rate is too low, and/or the algorithms that convert gestures into images are too non-linear to faithfully represent user inputs. This is important because quick keyboard use and light flicks on the screen really push the limits of the touch panel's ability to sense." Once again, comparing phones "feature for feature" doesn't tell the whole story. Apple's uncompromising commitment to usability drives their engineering choices in ways that might not be obvious to engineers or even consumers seeing an ad, but are painfully obvious after you've experienced how the thing should work.